Since the dining room is likely where you feast on flavorful foods, it doesn’t hurt to give it a little flavor of its own. What’s our favorite way to add character and ambience to a room? Through the use of color, of course. From subdued and serene to vibrant and energizing, these creative dining room paint colors are a feast for the eyes. Muted gray tones have a seriously stunning effect on a space when combined with light shades of blue. 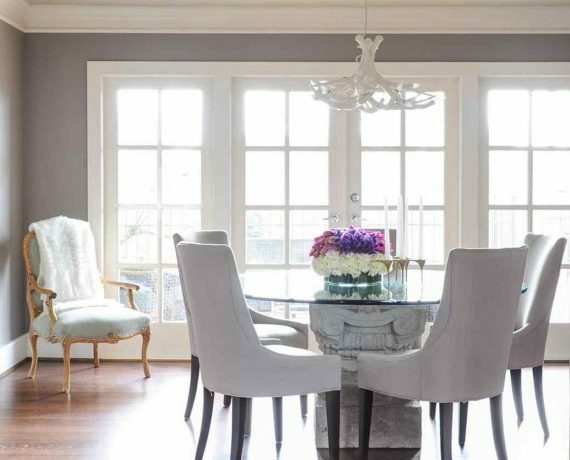 A dining room with ash gray walls framed by white window molding feels ethereal, especially when accentuated by dining chairs in a lighter shade of gray. A neutral color scheme doesn’t equate to a boring dining room. Dare to dress up your nudes and whites by mixing styles, such as pairing an industrial table with both traditional and coastal-inspired rattan chairs. You can also add flavor to a neutral space by introducing lots of accessories and art to the walls and table. A color scheme with a muted shade for its base can still have a warm and bright effect on a space. The ashy walls of this dining room are complemented by vibrant yellows and stark white décor for a look that evokes a sunny feeling. Black isn’t often recommended as the main shade in a color scheme, but this small dining area does it right. By bringing in a mix of patterns and peppy pops of color, the black is brightened and helps create a unique contemporary eclectic dining space. While black walls may not be for everyone, consider making a statement by painting one wall of your dining room black. When mixed with warm tones like tan, yellow, green or pale pastels, black makes for a surprisingly chic color story. Warm colors work wonders in dining rooms, but to avoid going overboard with vibrant tones pair them with monochromatic decor. The vivid orange walls of this dining room are softened by the black-and-white dining table and chairs, however, the contrast still makes for a bold color scheme. Other warm tones like brown and yellow look amazing when infused in small ways, such as the candlesticks, picture frame and chandelier. In a dining room with high ceilings, consider testing out a darker palette in some areas. A deep teal makes for a perfect statement wall, especially when paired with a mix of lighter and darker shades — think teak wood floors and white walls with a black table and buffet. Complement your teal wall with similar blue-green hues in other areas of the room. Sometimes there’s no need to pull out the paintbrush — you can change up the entire color scheme of your dining room by simply adding an area rug or swapping other décor elements. A dining room with bright white walls and lots of organic materials becomes complete with a deep blue area rug beneath the table. It’s a look that is as fresh as a cool ocean breeze. 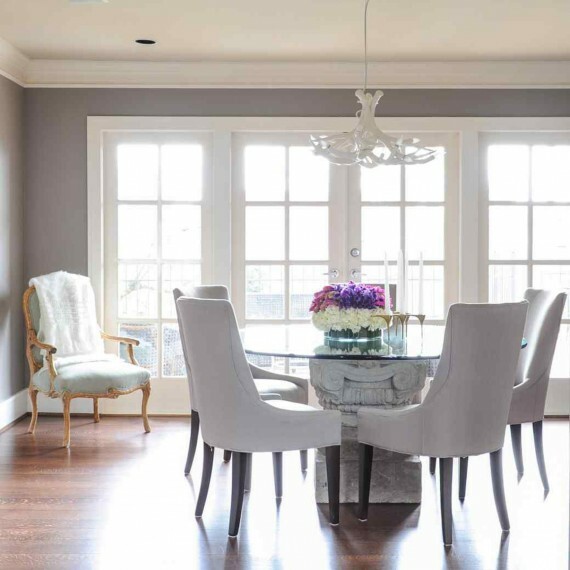 There are plenty of interesting dining room paint colors that can breathe life into your space, but if you’re still having trouble figuring out what color scheme is right for your space, there are experts who can help. With more than 600 hundred professional interior designers working around the U.S. and an easy-to-use online platform, Laurel & Wolf can help you figure out exactly what your dining room needs — accessibly and affordably. Start with a free quiz to discover your design style and begin to bring your dining room to life!